NPR News Nuggets: A Love For Pizza, A Race For Cheese & North Korea's 'iPad' Here's a quick roundup of some of the mini-moments you may have missed on this week's Morning Edition. 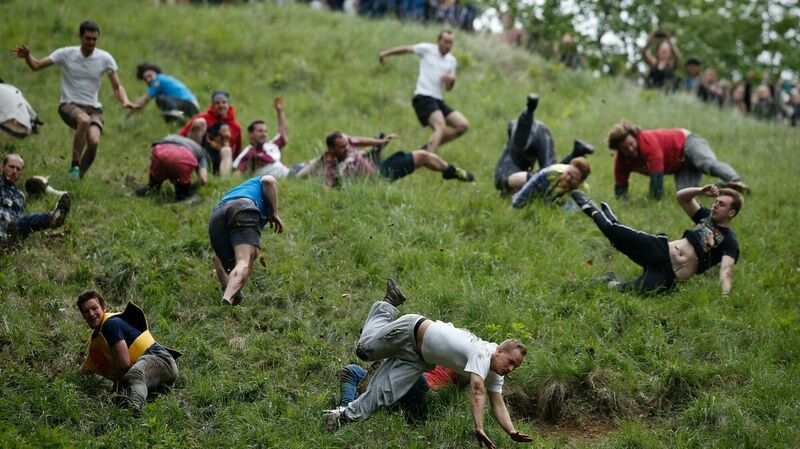 Competitors tumble down Coopers Hill in pursuit of a round Double Gloucester cheese during the 2016 cheese rolling competition near the village of Brockworth, Gloucester. What wouldn't you do for cheese? Maybe a little, or maybe a lot. In Cooper's Hill, England people are willing to put their body on the line. As Morning Edition host David Greene said on Tuesday, people hurl themselves down a hill — this is a really, really steep hill — as they chase after a 9-pound wheel of cheese. This event draws crowds of thousands and takes place on a traditional bank holiday in the country. Now if you're thinking about all the other things these people could be doing with their holiday, you're not alone, but they do this for the cheese, and maybe for the glory. In the process of chasing after the wheel, people trip over each other. Really, they take a quite tumble, and some end up rolling down the hill like the cheese. In the end, the winner of the race gets the cheese. This year's cheese champion took home his 20th wheel, but he said he's not keeping it. Instead, he'll send his prize to an auction. Apparently, the tumultuous cheese is a bit too strong for his taste. It turns out that if you wanted to go live in North Korea, you wouldn't have to give up your favorite technology, like your iPad. It's better to say, you wouldn't have the iPad you're accustomed to. It would be the "Ryonghung iPad." As Morning Edition host Steve Inskeep said Thursday, a North Korean company claims to have invented this new iPad. Yes, it's a trademark violation, but that hasn't stopped the country before. North Koreans also have a Netflix service. It doesn't have much variety though, as it mostly features programs about North Korean leader Kim Jong-un. 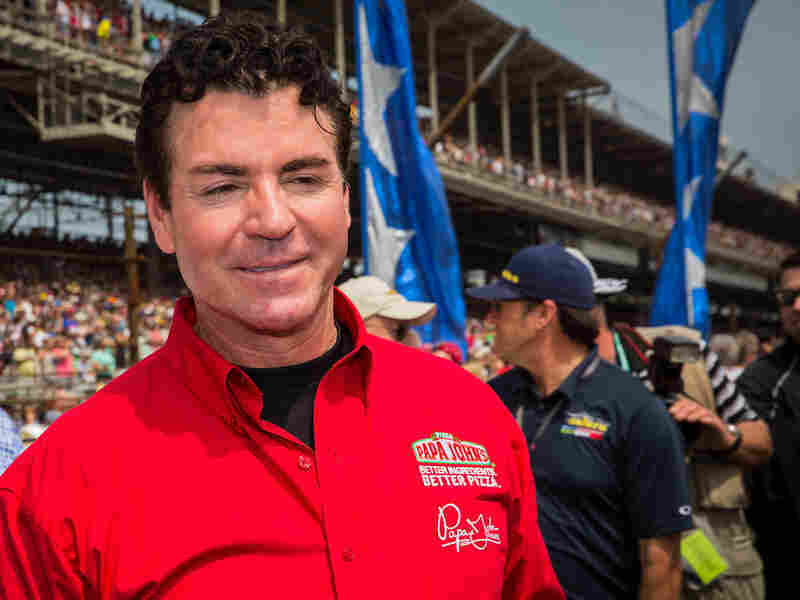 Papa John's founder and CEO John Schnatter created a pizza chain that inspired a college essay, that then led to a college acceptance to Yale University. College essays are a necessary evil. Seriously, sometimes prospective students get only 250 words to explain what they think their purpose in life is and how a specific program or degree is going to help them fulfill it. Nevertheless, they all have to write them, especially if they're aiming to get into a prestigious school. Carolina Williams knows this well. As Morning Edition host David Greene said on Friday, Williams told the The Tennessean she chose the first topic that came to her mind: Papa John's pizza. Apparently, to get into Yale University you have to write about something you love to do, so Williams wrote about how much she loves ordering pizza from Papa John's. Specifically, she wrote about how slices of something ordinary evoke feelings of independence and joy. The essay wasn't cheesy at all, and yes, she got in. Williams then posted a note she got from an admissions officer telling her the officer laughed out loud reading the essay, and then ordered a pizza. Pizza lovers unite.